Highly desirable garden plants from the Ginger Family with attractive foliage and very showy flowers. Most of the species are pleasantly fragrant and enliven the garden by attracting butterflies and moths.� Some of the Lily species� plant are cold hardy, and deciduous during the winter months. 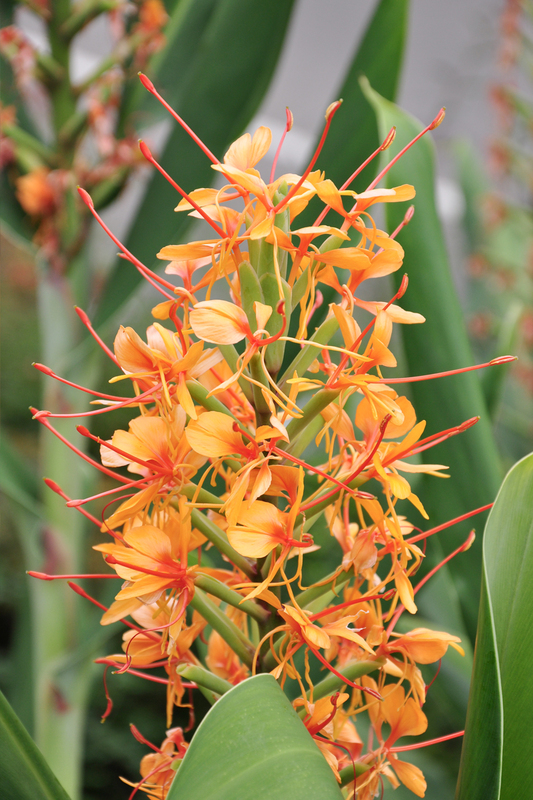 (Orange Butterfly Lily) Robust, perennial plant upto 2 m. high with stiff leaves, smooth green above and bluish beneath. The scarlet red flowers with pink filaments are borne on dense stout spike. Mature dormant flowering size rhizomes offered. Loves well drained potting compost with grit, loam and leaf mulch mixed in equal parts. Feed and water well during growing period. Keep moist during dormancy. Prefers 50% light though few can tolerate up to 70%.